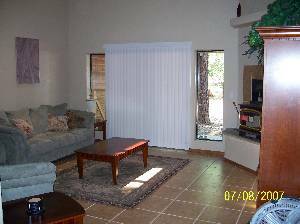 Very nice 2000 square foot vacation home located in Pinelake Meadows Estates. This private home is 1 mile from hwy 260 at the end of a paved road which dead ends, next to a picturesque meadow and across from a private lake full of trout and catfish. 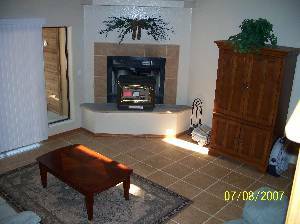 This home is newly furnished along with new tile, carpeting, and paint. Everything you need to relax and have fun is here. 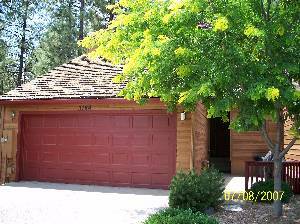 This is a very scenic area with large mature ponderosa pine trees all around. This beautiful home has 2 levels with very high vaulted ceilings on both floors. The balcony overlooks several tall pines with lots of squirrels, blue jays, and other wildlife. In addition, ducks, geese, elk, and deer can be occasionally seen in and around the lake and meadow. It is very quiet and kid friendly. 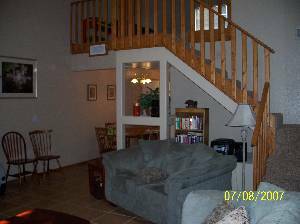 Amenities include: 2 full bathrooms, large loft with full-size sleeper, King bed in very large master bedroom, 2 full beds in bedroom #2, 1 full bed in bedroom #3, 2 car garage, appliances, cable TV with VCR/DVD in family room, master and loft, stereo, fireplace, internet access, washer/dryer, coffee maker, microwave, and more. This home can comfortably accommodate 6-8 people. 23 miles to Sunrise Ski resort. 3 miles to HonDah casino. 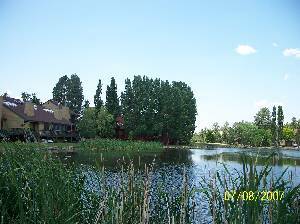 Your place is very relaxing, the kids loved the trout lake. Casino is just minutes away, so is bowling, more fishing and restaurants. Would love to stay again, please keep this one on the Vacation Rental list! Wanted to thank you, we had a great time and would like to rent your place again in the spring. It rained almost every day in the afternoon and got REALLY cold for us desert rats. playing up in the loft. Thank you guys very much for a relaxing weekend. Your house is beautiful. Sorry for the late reply, I've been busy I guess. Our stay at the townhouse was great! No complaints at all. Everything went very smoothly thanks to the detailed instructions that you supplied. We caught several bass in the lake, cooked steaks on the grill, and roasted marshmallows in the fireplace. 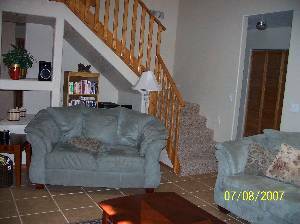 The townhouse was very spacious and very clean. My kids enjoyed all of the toys in the loft and playing on the balcony. The neighborhood is really nice, and quiet. Thanks again...we had a great time. 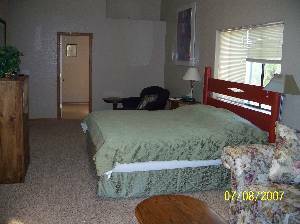 In season: Memorial Weekend to Labor Day weekend; $175/night first two nights, $160/night for each additional night; Stay 6 nights and get 7th night free; weekly rate is $990 Off season: All other days; $140/night first two nights, $130/night for each additional night; Stay 6 nights and get 7th night free; weekly rate is $800 These rates are for four people or less. For any person over the age of 5 an additional $10.00 per day/per person rate will be charged. After the first 2 nights, the daily rate is discounted ($160-peak & $130 off-peak) but the per person rate is the same for more than four people. Stay for 6 nights and get the 7th night free. Major holidays require a 3 night minimum stay at the peak season rate of $175/nt. Additional nights charged at the seasonal discounted rate. Major holidays include: Memorial Day, 4th of July, and Labor Day. Discounts are given to any previous guest who returns or refers a new guest who rents. Deposit: A tentative 5 day hold will be placed for you upon making your reservation. Within 5 days we must receive the following: a completed agreement, the security deposit, the cleaning fee, and ½ of the rent. Once received, your reservation will be secured. We must receive the balance of your rental fee within 30 days of your arrival. Cancellations and Refunds: 21 day email notice to receive refund for cleaning fee, security deposit, and 90% of rental amount. 7 day email notice to receive refund for cleaning fee, security deposit, and 50% of rental amount. Less than 7 day email notice will result in refund of cleaning fee and security deposit only. Other Fees: Refundable security deposit of $150.